Nestled within the beautiful medieval village of Lavenham, this stunning 15th century luxury hotel is steeped in history but perfectly combines a deep sense of heritage and occasion with contemporary sophistication in its rooms, first-class restaurant and indulgent spa. This beautiful summer teacake recipe comes from the Pastry Chef, Anmar Odendal. Sieve the flours and cocoa together, add the sugar and mix well. Rub in the butter until the mixture resembles breadcrumbs. Make a well in the centre and add the egg, syrup and orange zest. Mix the ingredients remembering to scrape the sides of the bowl down, until the mixture forms a smooth ball. Wrap with cling film and leave to rest until needed. Roll the dough out in between two sheets of greaseproof paper, taking care not to add much flour as this alters the recipe. Roll the dough to about a 5mm thickness and remove the top layer of paper. Cut the dough into circles with a 5cm cookie cutter and place the biscuits on a baking paper lined baking tray. Rest in the fridge for 20 minutes. Bake is a preheated oven at 165°C for 12 minutes till done. Let the biscuits cool completely before using them in the next step. Preheat the oven to 200°C. Place the sugar on a paper lined baking tray and place it in the oven. We want to heat the sugar, but not melt it – this can also be done in the microwave for a few minutes. Place the egg whites in your mixer and mix on medium heat until the mixture has formed bubbles, now turn the mixer up and whisk the egg whites till stiff. We want the eggs to be stiff, and the sugar to be hot at the same time. Turn the oven down to 100°C. While the mixer is on full speed, start adding the sugar in 3 even batches, making sure it whips up till stiff again after each addition. Once all the sugar is added, leave the mix to whisk until all the sugar is dissolved. You can test this by rubbing a bit of the mix between your fingers – if it feels grainy – whisk it a while longer. While your meringue is whisking you can cut some greaseproof paper to fit onto your baking trays, and use the same cuter you used to cut out the cookies earlier to trace circles all over the baking paper. You will use this as a size guide to pipe the meringues so that they fit on top of the cookies. Turn the paper over that the pen side faces downwards and secure the edges of the paper with a tiny bit of meringue. Place the meringue into a piping bag and cut the tip of the bag off to about the size of a 50p coin. Using a piece or cling film or elastic band to tie around the top of the bag – this will prevent the mixture from spilling out. Pipe the meringues by holding the bag upright and squeeze the bag with the hang that is holding the top of the bag. Holding the bag about 2cm above the paper, aim the bag to the circles you drew on the paper and squeeze the bag until the meringue comes out of the bag. Hold still while doing this – when your meringue is just about to fill the circle on the paper, stop piping and lift the bag straight up. This will form the iconic tip on the meringue. Place the meringues in the oven and bake for about 40 minutes. They are ready once the meringues lift off the paper without falling apart. Don’t open the oven whilst baking either – they can fall flat. Place the dark chocolate and oil in a glass or metal bowl over a pot of simmering water, stir until melted. Remove from the heat and leave to cool for a few minutes. Stir in the rosewater. Use a bit of the mixture to stick the meringues onto the biscuit bases. Place them in the fridge for a few minutes to set. 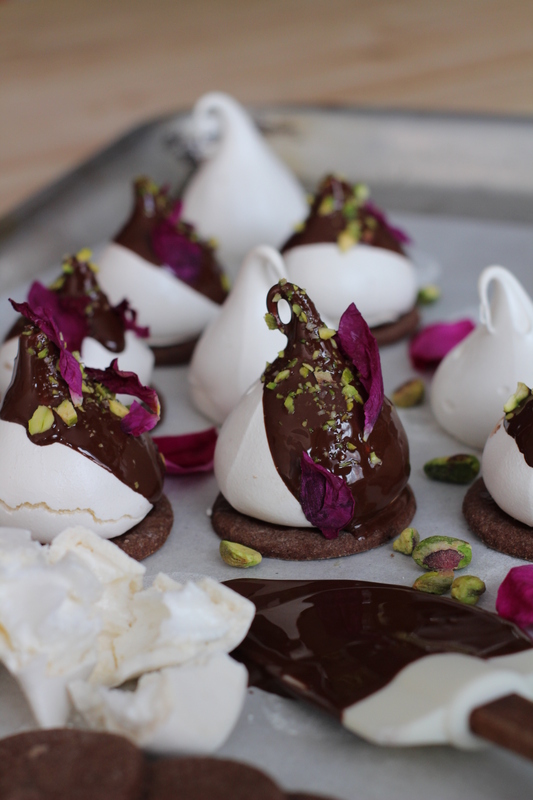 Now dip the tips of the meringues into the chocolate and sprinkle with the pistachio nuts and the crushed rose petals. Leave to set and store in an airtight container. Anmar is a professional chef, originally from South Africa and the current pastry chef at The Swan along with running her own Bespoke Cake Company, Crumb. 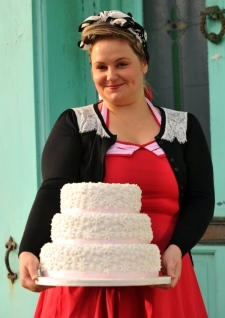 An award-winning wedding cake baker, she is responsible for some amazing creations that have featured in OK! Magazine and was awarded Best Wedding Cake designer East of England and appeared in the top 20 Wedding Cake makers in the UK. She is also an avid Roller Derby enthusiast. The grand Gallery Restaurant in the heart of The Swan offers British dining all set within superb medieval surroundings – it’s striking high timbered ceiling and handsome minstrels gallery together with exposed brickwork and impressive fireplace set the scene for a unique dining experience. Dishes are beautifully presented and full of flavours from Suffolk and beyond and a sommelier is always on hand to assist with wine pairings from their extensive list. 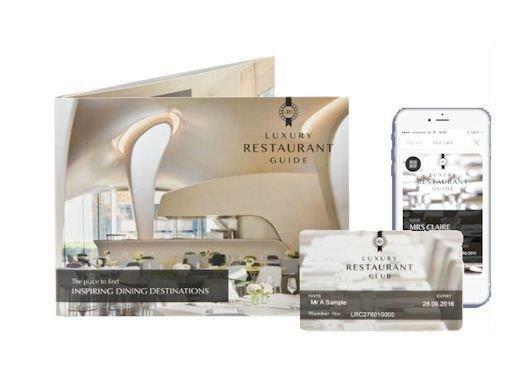 The Club Member Offer: Members receive a 10% reduction from the total food bill when having lunch on Sunday, Afternoon tea Monday to Thursday and dinner Sunday to Thursday. Click here for more details. The Brasserie overlooks the gardens and is a perfect spot for enjoying a long and relaxing lunch or catching up with friends over a chilled glass of wine. Chelsea-based interior designer Todhunter Earle blended the Swan’s historic medieval features such as original stone floors, large fireplaces and vibrant stained glass windows with stylish oak furnishings and a calming colour palette to create a bright and modern dining space, secluded by screens crafted specially for the Swan by local Suffolk metalworker. The menu includes traditional British favourites and seasonal lunchtime salads, sandwiches and specials, as well as having cutting-edge Healthy and Nutritious options available. The Club Member Offer: Members receive a 10% reduction from the total food bill when having lunch and dinner Sunday to Thursday. Click here for more details.